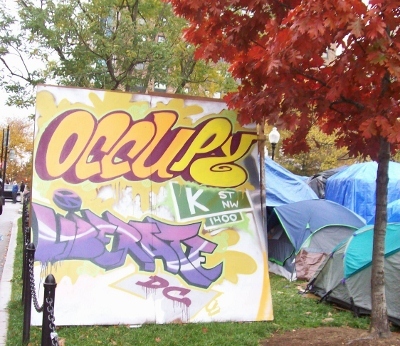 We stopped by McPherson Square today to see the area occupied by Occupy DC. After all the reports from the media I wasn't sure if I wanted to travel there or not. It turns out that there wasn't any reason to worry. The protesters we spoke with were all friendly. You can see much of the area around the park in the photos. In addition to the photos shown below I have some on the Yahoo Contributor Network. What was interesting about my visit isn't only the protesters themselves but other activities in the park area. Tomorrow is Veteran's Day. A stage was already set up with a band across the street from the Occupy DC protesters. It was the center of a crowd of onlookers that appeared to be tourists. 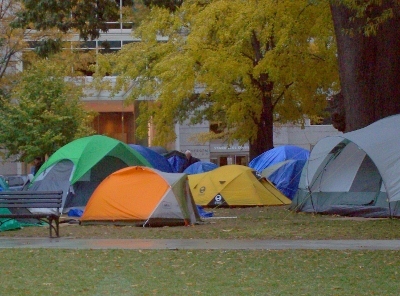 Some of these were also checking out the activities in McPherson Square. It is enough to make me wonder if the occupation is going to be a travel destination. Many people who walked past ignored both groups as they went about their business. A busy Starbucks on the corner seemed to be a catch-all gathering spot. Fortunately for us the line moved quickly. It was an intriguing mix of people and an interesting way to spend the afternoon. Hopefully tomorrow we'll be able to travel to some of the sites in DC. The monuments will probably be packed but we may try to see the National Zoo or Rock Creek Park.